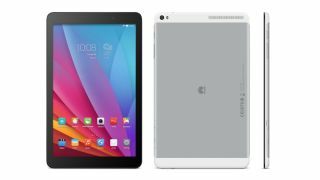 The Huawei T1 10" is a tablet that puts a strong emphasis on bringing you entertainment no matter where you are, and is now available to buy exclusively from O2. Although the name of the Huawei T1 10" could lead you to assume it comes with a 10-inch display, the IPS LCD display is actually 9.6 inches, which should still be large enough to watch movies and TV shows on. We asked Huawei to clarify the size of the screen, and were told that "the Huawei T1 has a 10" screen and offers a 9.6 inch IPS LCD display", which doesn't actually clear things up at all. At least the rest of the tablet is more straighforward, with an ultra-slim body which is just 8.3mm thick and weighs in at 433g. This should make the T1 Tablet easy to carry, while the 4,800mAh battery should ensure the slate doesn't die halfway through a film. It comes with 16GB storage, though you can expand it to 64GB with a microSD card. Sadly it doesn't come with Android 5.0, so you're stuck with the slightly older Android 4.4 for now, but it could see an update in the future. There's a 1.2GHz quad-core chip and 1GB of RAM, along with a 5MP rear and 2MP front camera, and as well as Wi-Fi connectivity, the Huawei T1 10" also comes with 4G LTE. It's available exclusively from O2 with a £18.50 pay monthly contract, and can also be bought from O2 without a contract for £199.99.